When I was first exposed to 'improv', I was absolutely petrified. Coming from a classical dance background where almost everything is well thought out, 'fixed' and rehearsed well before it is displayed, I found myself totally frozen. I could not enjoy myself and I certainly did not impress. Dance Improvisation, for those who aren't familiar, is the process of creating movement spontaneously. 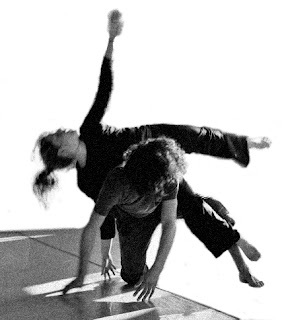 There are several tools and methods to do this - one can use internal impulses, music, emotions, silence, a particular story or event, or another body/bodies (contact improvisation). It is a movement method that encourages you to step out out of your usual dancing patterns. When I first became exposed to it, the more exposure I got, the further I went into my shell. It soon became a mental block.Then recently, mainly because the week-long event with dancers meant a lot to me, and I shared the week of dancing with people who's opinions, approval and critique really mattered to me, I was forced to address these fears and finally lost my fear of improv. I would still say I have a long way to go, but losing that fear, I realized, is really the big first step. The entire process made me reflect on what made me so afraid of improvisation. I share them here because I know I'm not the only one who's been afraid of improvisation, and perhaps what I say will be informative or will simply give a sense of relief to those who think they are alone in feeling this! Firstly - Improvisation meant stepping into a completely unfamiliar world where I had to generate some sort of creativity in my body almost instantly. It was like I didn't have time to think! For a classical dancer, where everything is carefully thought out, this was a mammoth challenge. Second, because the form of dance I knew was about learning something, and practicing it by repetition in order to thrive for perfection, the fact that many a time, the small movements generated in improv were not 'impressive' or 'perfect' really troubled me. Third, I felt at a constant disadvantage because the only technique I could impulsively bring out in the body was Bharatanatyam (despite having learnt others for shorter periods of time). My teachers were pushing me to generate something unfamiliar to me but I was unwilling to do something 'uncertain' in front of people. Next, I felt watched and judged. Now this might seem odd. The many years that I had danced and performed on stage had also involved watching and judging by a lot of people. But this watching was different. I wasn't being judged on perfection of form and technique, or how I used my face while doing abhinaya. I was being judged (I'm not sure I buy that argument that no one judges anyone when doing improv) on something else. I thought it was my creativity. That judgment frightened me too, because while I didn't doubt that I was creative, I somehow failed to impress my teachers, peers and even myself every time. Finally, outspoken and 'open' as I might seem, I am quite private about certain things. Particularly about things that mean a lot to me, one of which is dance. Improvisation had a way of making me feel totally exposed, and totally vulnerable. I didn't like that discomfort at all. Because of all this and much more, I had worked myself up into such a frigid frenzy that the very mention of the word 'improvisation' sent panic signals to my brain that translated into atrophy of sorts in my body! My heart would sink, my mouth would go dry, my body would stiffen, my brain would freeze. And as it is with vicious cycles, this frigid frenzy made improvisation all the more difficult. In fact, in that state, improvisation was an utterly futile exercise.